I haven’t blogged about my day-to-day at PLC at all, so I’m glad to have #DITLife as a kick in the pants to do some writing and reflecting. We’re on a weekly schedule at PLC. Classes happen once a week. Every day of the week is different, but each week has the same rhythm to it. That said, every day is different, because a lot of what happens at PLC doesn’t happen in classes. Note that we call the teens who attend PLC “members”, rather than students. 8:30 am – Arrive at PLC. Say hi to folks who are already there in the common room. Find a spot on the couch to organize for the day—email, browsing some videos about Thomas Was Alone for my video games class, and putting together some feedback on an essay one of my mentees wrote to apply to Simon’s Rock College. Chit-chat with members and staff. Lay plans with a member to make a giant pompom—more on that later. 9:15 am – Help to greet a potential new member who is visiting for the day–A, an eighth-grader from a local public middle school. She and her mom had come by on Wednesday for an hour or so, for a tour and an initial conversation. (The conversation was exciting, because it was the first time I did one of those initial meetings on my own.) They also attended our Outside the Box event last night. I showed A the day’s schedule of classes, then passed her off to a couple of members who were nearby and went back to my couch and computer. 9:40 am – K arrives to PLC and have a brief mentoring meeting—checking in on how his application to Simon’s Rock is going, chatting about the fun we had ice skating on Monday, and finding out how his week’s been. 10am – Introduction to Programming. Three members, me, and A worked on Scratch projects in a classroom. One member is working on a platforming game with some unusual physics, another is just starting a new game after his successful “Underwatermelon”, and the third searched the web for sound effects for her Dragon Ball Z fighting game. A was new to programming, so I set her up with the tutorial on scratch.mit.edu, and before long she has a couple of sprites dancing around with sound effects. Alongside of checking in on their progress and chit-chatting with them, I started trying to make a Scratch “Pong” game, but then headed in the direction of making a “Pong” musical instrument instead. 11am – Last week we had a wine-and-cheese outreach event for local mental health professionals. It was held at K’s family’s house. As people were arriving and mingling, K had the idea of showing me his pompom making supplies. (Like this.) And then, of course, we made one. :D So this morning K came up to me and said we ought to try making a huge pompom with a hoop-thing we’d make ourselves out of cardboard. And so we dove into that during this hour. I also shepherded A off to go with a staff members and a couple of members to a construction site nearby. Bob Hillier, a local architect, was going to give them a tour of the site. A had at first thought she’d stay at PLC to see me work with another member for our calculus tutorial—but it’s especially good that she went on the trip, because my calculus student had been busy with other things this past week and so we decided not to meet. And I made a giant pompom with K instead. 12:15 pm – Recess! This is a class I run on Thursdays during the noontime lunch period. We go outside (typically) and play some sort of athletic game. Today we played Spud. I think we got up to eleven participants at our max. A simple game, not as exerting as some of the other games we’ve played, but a lot of fun. We adapted the rules so that we “ran away” in different styles, like “baby steps” or “spy crab”. 1 pm – Briefly checked in with a member who’s one of our photographers. We’ve been trying to put together a system for getting photos they take onto PLC’s website, Facebook page, and elsewhere. B laid out a sensible plan that we’ll run with. 1:10 I usually have a Geometry tutorial this hour, but I checked in with N and he decided to hang out in the common room instead for the day. He’s really self-motivated and has been working through a Geometry book on his own and with the support of his grandma. Our meeting times are really just him working on his own, with him asking me an occasional question or me offering some additional resources or ideas. So for a chunk of this hour today, I went back to doing some of my own odds and ends of work. I did, however, meet with a member M who doesn’t do classes very much but who has been talking off and on about getting back into doing some math. He had asked me about my geometry tutorial earlier in the day and I said I’d print him out a couple of angle chasing worksheets. I saw him going into the workshop during this 1:00 hour and poked my head in. He’s in there a lot, working on various construction projects. So I invited him over and he and I sat down and did some geometry for part of the hour. 2 pm – Video Games class. I had sent around a link to Thomas Was Alone in the interval since our last class. Some kids had played it some, others weren’t interested in it. We chatted some and played the video games we wanted to some. Pretty low key. 3 pm – With the day wrapping up, I found A to chat about how her day had gone. For a while it was just me and her and later another staff member joined us. A talked about details she noticed at the construction site, about how her long math session with a staff member had given her the chance to ask many of the questions that she hadn’t felt comfortable asking in class, and about how at PLC there are so many opportunities to interact with people and how everyone is so friendly. We then talked about different timelines for joining PLC that are possible—right away, after Thanksgiving, at semester—and how she might approach explaining her choice to the people in her school life—if in fact she decides to come to PLC. 3:30 pm – Chatted some with A and her mom and two staff members out in the common room as they (and we) wrapped up our day. Hopefully they’ll have a good chat tonight, and maybe we’ll see them again soon! just becoming aware that math teachers learning from each other online is a thing that happens, and your interest has been piqued? new to Twitter and blogging, with your feet wet, but looking for a chance to really take a deep dive—to get more involved? someone who’s blogged and tweeted for a while, but wanting to try out some new things, meet some new people, and engage in a little MTBoS fiesta? Then Exploring the MathTwitterBlogosphere could be right up your alley! ExploreMTBoS is low-stakes but high-reward. It’s eight weekly “missions” to scope out different ways of engaging with people in the MTBoS, plus an opportunity to write about your experiences. That is, eight weeks of “here’s a thing you could do” and “here are some writing prompts about it or something related”. You’ll have the chance to read other participants’ reflections, chat with them on Twitter, and…flash mob? So head on over and sign up. You just have to introduce yourself in a comment. Then be on the lookout—through the blog, Twitter, Facebook, or email subscription—for your first “mission” on October 6! On a personal note, one part of why I’m excited to be helping out with Explore MTBoS and participating in the missions is that it’ll help me to stay connected with a community I care about and to make new connections. I’m in a different headspace these day and have different kinds of tasks and challenges on my plate—like coordinating volunteers, putting together field trips and events, and helping with open houses for potential PLC members. And while I’m working with a few kids one-on-one with math and I’m running a Math Munch class once a week, much of my teaching is happening in other subjects—physics and programming and video games and poetry and PE. Anyway, this is just to say that I’m having a blast with new things, but I’m grateful to have this way to stay engaged with the MTBoS. I hope you’ll join up for Exploring the MathTwitterBlogosphere, too, and encourage others to come share in the fun of the MTBoS. There’s something for everyone! 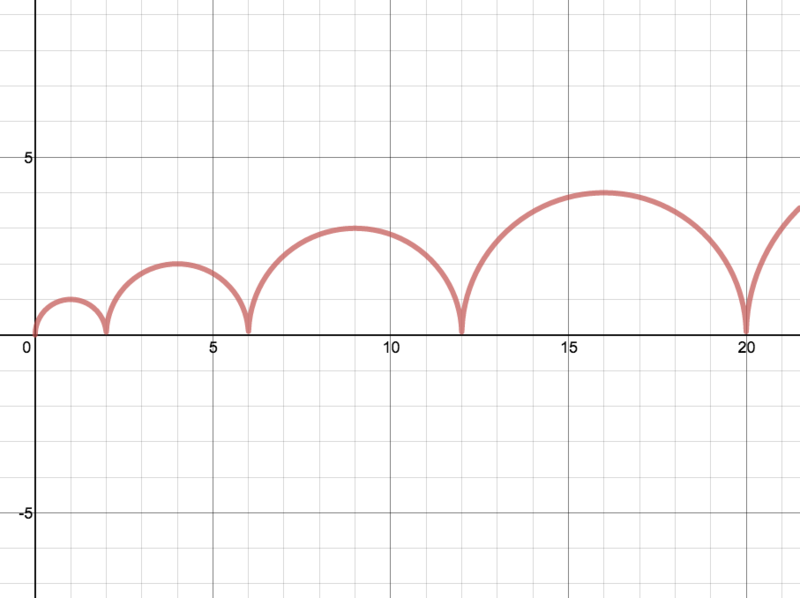 One of my favorite Daily Desmos challenges that I’ve created so far. What’s Daily Desmos? Well, I’ll link you to our How to Play page, but basically it’s a collection of graphing challenges created by a motley band of math teachers. Each week, Monday through Friday, someone presents two graphing challenges—one basic, one advanced. The most straightforward challenges are just a graph and the challenge is to create an equation that will create that graph. Straightforward, but necessarily all that easy. And other kinds of challenges have cropped up along the way—dots to be hit or avoided, animations, partial pictures, and more. At this point we’ve created hundreds of challenges, and there’s no sign of us slowing down. Definitely try some out for yourself! And there’s another component to Phase Two. These weeks will be a testing ground for interesting linear graphing challenges—generating ideas, throwing them up against the wall, and seeing what sticks. In the background we’ll be working to craft a sequence of linear graphing challenges that could help a student who’s new to linear functions to ramp up their understanding and fluency. The end product will be posted as a stand-alone problem sequence on the Daily Desmos site. The effort will be spearheaded by the inimitable and prolific Michael Fenton. I can promise that whatever we put together won’t be a mere bottomless pit of procedurally generated “graph this linear function” exercises. Creating challenges for Daily Desmos has been a ton of fun for me. I’ve learned some graphing tricks in the process, it’s been a creative outlet, and I’ve gotten to work with some really fabulous and passionate tweeps. I can heartily recommend signing up. If being a part of Daily Desmos sounds intriguing to you, just tweet at me or another crewmember, or shoot one of us an email. Math Munch has changed my classroom. It’s changed my students, and it’s changed me. These changes have been so vital that it’s actually a little difficult for me to place myself in my old shoes, pre-Math Munch. Here are two stories that can help illustrate part of what’s happened. 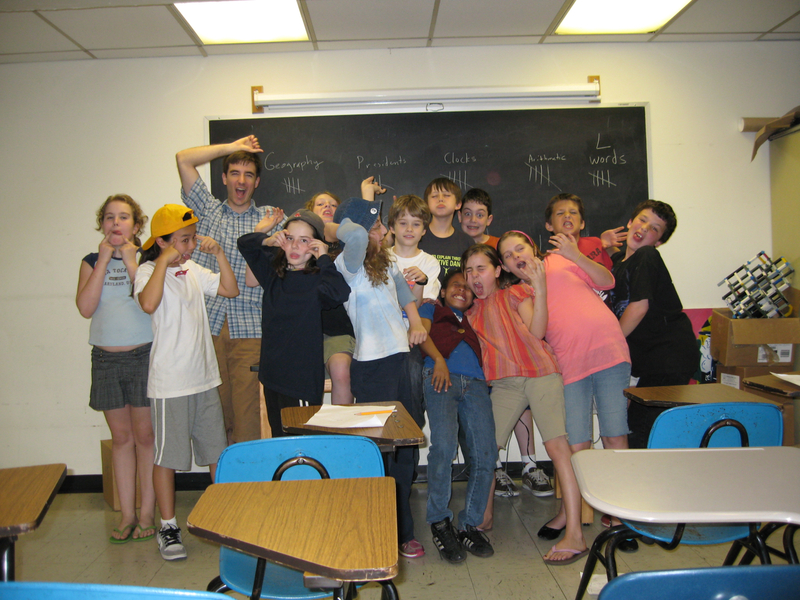 My first year of teaching at Saint Ann’s, I taught a class of fifth graders. It was a fantastic class, and I feel like in many ways I cut my teeth as a teacher with them. I bring them up because at the end of the year, they asked to play a game of Jeopardy, as they had a couple of times previously. This time I said yes. I chose some categories—both mathematical and not—and put them up on the chalkboard. Turns out I have a photo from that exact day! After breaking up into teams, we started playing. I noticed that my students were only picking from the non-math categories. Even then I realized on some level that this made sense—that feeling like you’re getting away with something is a pretty strong motivator. Still, at some point during (or maybe after) the game I asked them about it, because a part of me was a little hurt, I think. I remember making a little speech, about how I thought we’d had a great year together and done a lot of interesting math, and I wanted to know what was up with their category selections. Their answers were of one voice and so sweet: We love you! We like you! We think you’re great! Don’t think that we don’t like you or your class, because we do! And then I said how I was very glad that they liked me and the class, and that I liked them, too. But more than them liking me or the class, I wanted them to like math. That if we had done this whole year together and they didn’t feel any closer to mathematics, then I felt like I hadn’t really done my job. It was a pretty serious moment. I’m glad, though, that I didn’t take all the air out of the room, as the photo above testifies. I think that this experience was part of the seed that eventually brought me to Math Munch. At the end of this past year, I asked my seventh graders to fill out a survey to help me to place them into their eighth grade algebra classes. There were lots of useful things said. There were also plenty of sweet things said about our class and me personally. But a lot was also said about particular structures, both explicit and implicit, that I’ve incorporated into my classroom. Something that particularly warmed my heart about the above response is that it doesn’t mention me, but it does talk about things that I value, and it mentions Math Munch. There is a Buddhist saying to the effect that when you point out the moon to someone, it’s necessary that they look beyond your finger in order to find the moon. Otherwise, they might just stare at your finger! As teachers, there are as many ways to share mathematics as there are to share ourselves. The personal connections I make with my students are important to me. Perhaps at this point—in comparison with seven years ago—I might even say that they are primary to me. And my students’ relationships with me and their relationships with mathematics are of course intertwined and connected. That’s a joy, and I wouldn’t change it. But I also want my students to have relationships with mathematics that go beyond me. I don’t want them to get stuck on my finger and miss the moon. I want my students to have a connection to mathematics that they can return to and carry with themselves, independent of me. Math Munch helps me to do that. It’s a place away from myself where I can point, a window that is mostly transparent and that shows the great beyond. Math Munch moves the reality of mathematics from my own experience and imagination into theirs, which makes it way easier to point to and way easier for them to catch sight of. I bet Math Munch could help you and your students shoot for the moon, too. I’ve been keeping this on the down-low for many months now, but I’m moving on to new adventures professionally this fall. My seven years at Saint Ann’s were enormously satisfying and growth-promoting, but over a year ago I began a search for a new opportunity to contribute to a community of learners. Figuring out what I wanted that new opportunity to look like—and then actually finding a slot where it could happen—has been a long and textured journey. I’ve learned something about the educational landscape in the US in the process, and I’ve definitely sussed out some aspects of myself that I didn’t know about or that weren’t in focus for me before. I haven’t said much about all of this before now, because where I’d land was up in the air until just recently, and I wanted to be able to share the news of my transition in a future-oriented way. So here goes! I’m delighted to share that I’ll be working at the Princeton Learning Cooperative in Princeton, New Jersey. To get a real sense for the place, you should check out our website. Briefly, though, PLC is a supportive community that helps teenagers that are having unproductive school experiences to leave school and begin directing their own learning and lives. From a legal standpoint, these teens are homeschoolers, but not the kind where their parents sit them down at the kitchen table and teach them school subjects. In some ways PLC is like a free school, but it doesn’t have an attendance requirement. It’s not a school. It’s an “unschooling center.” Even though this is the case, staff members and volunteers offer classes and tutorials that members (not “students”) can choose to take, and each member has weekly mentoring sessions with a staff member to help them in their self-direction. It’s very hands-on and personalized—helping young people to learn what they want and providing them with opportunities to figure out what that might be. No holds barred. I bet you can see the sparkle in my eyes all the way from over there. There will also be lots of opportunities for me to contribute to the structure, design, and execution of the program. All together, it’s really a fantastic match and I could not be more thrilled to have found PLC. Believe me, you’ll be hearing (if you wish) a whole lot more about it in the weeks and months ahead! That’s me on the staff page! This all of course means that I’m moving on from Saint Ann’s. Leaving a place where I made so many fond memories is definitely tough. Leaving behind my great students and colleagues is tough. And I’m way bummed that Michael and I are currently doing our best impression of two ships in the night. Still, I’m ready and excited for new challenges. The metaphor that I’ve been using is that when I showed up at Saint Ann’s with by big britches and bigger ideas, they gave me blank canvas after blank canvas, nicely-sized, and all the colors of paint I could want. Seemingly infinite possibilities! And that wasn’t an illusion—there really are infinite possibilities and a lifetime of craftsmanship to learn and employ in the medium of a Saint Ann’s classroom. But “infinite possibilities” doesn’t mean that every possibility is open. Try as you might, you can’t do a tiny painting on a regular-sized canvas without it looking silly, and you’ll have a hard time painting a mural. Making a sculpture is a definite no-go. As an artist (if you’ll bear with me), there are experiences I want to help create for and create with young people that can only happen at a place that’s different from Saint Ann’s. And so I wish it well and recommend it heartily and will keep in touch with folks there, but I’m off to see what other art I can make. After just a few weeks of interacting with the staff and a few members and parents at PLC, I feel really valued for my skills, my energy, and my ideas. I feel like I’m going to be able to do a lot of good, both for our members and for this community, and I know that doing this work is going to be good for me. What classes exactly I’ll be teaching is still up in the air, but it’ll likely be some math and a lot of other things, like a poetry workshop and a video games class. I’ll also be coordinating the Mondays program. No classes are scheduled for Mondays—they’re reserved for trips into the community and hikes and such, as well as for one-off or short-term workshops and guest speakers. Lots of room to experiment in new ways! I feel really pumped up and secure in my decision to join PLC. It feels just so, so right. The only twinge I’ve felt is—get this—losing you guys, my wonderful personal learning network on Twitter and the blogs. Since I won’t be a math teacher per se anymore, will I still belong? Will my thoughts and experiences still be relevant to the discourse in this community? I’m not really all that worried, because I’d miss y’all too much, and I know that I’m involved in projects and conversations that won’t be affected by my relocation. But what this has made me realize and appreciate is how big a part of my professional and personal identity is wrapped up in the goings-on of the mathtwitterblogosphere—with you wonderful people who I get to have as colleagues, co-conspirators, and friends. Thank you so much for that. So here’s to old adventures and new adventures! And just adventures! Yay! Twitter Math Camp was wonderful. I really appreciated how amazingly easy it was to join up for meals and hang-out sessions. I typically find unstructured social time to be really challenging. I’m likely to opt out. I loved how simple it was to fall in with a group that was going out to dinner or to a bar. I didn’t have to be invited, I didn’t have to have an “in”. Whenever I walked into the hotel lobby and there were people there—and there were definitely going to be people there—I immediately felt welcome. I don’t think I’ve ever experienced something quite like that before—being a part of a fluid pack, a ranging throng. At the same time, I also got to have some really fantastic one-on-one or tiny group conversations. It was really neat how larger and smaller group interactions so naturally and seamlessly flowed into teach other. There were super silly times, and hilarity, and shenanigans. Dance parties and fro-yo runs and an end-of-camp hug-it-out. We screamed at the tops of our lungs, we bursted out in uncontainable laughter. But there were also these quiet moments. Intense, heartfelt conversations with people I’m used to having jocular give-and-takes with on the Twitter machine. There were long, meditative walks. There was vulnerability, and openness, and deep trust. We were our whole selves. It was remarkable, but totally explicable, because these were people who I already knew well—even though we were meeting face-to-face for the first or close-to-first time. The people. What amazing, wonderful people. For illustrative purposes, I’m going to single out two whom I got to spend the most time with, and one with whom I spent almost none. 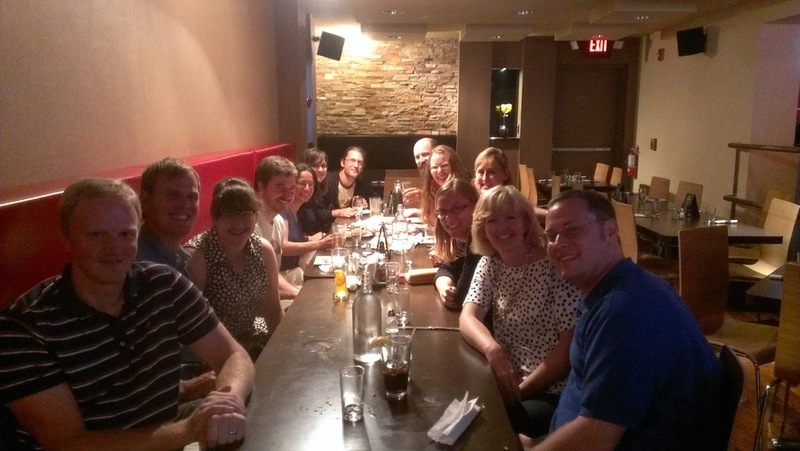 But there are so many, many more—these folks are just indicative of the experiences I had. Dan Goldner, leading his PBC session. I’d interacted with for years with Dan Goldner (@dangoldner), mostly through reading his blog, but we met for the first time at TMC. I already knew that I liked and admired Dan, but suddenly I had the flood of awareness that I knew almost nothing about him, about his life. Suddenly there were so many new layers and nuances and a passion that I had only before seen through the lens of a screen. So many good times— nerding out over a Daily Desmos challenge poolside, problem-wrangling in our morning sessions, being guided in his standout session about problem-based classes, hearing him describe and process his coordinating efforts with his department over dinner. So much. And I know there’s much more in the future. Thanks, Dan. Jasmine Walker, sharing her My Favorite. I had zero knowledge Jasmine Walker (@jaz_math) before TMC. Bizarrely enough, we got to meet in person without a previous digital relationship. (Though we did later figure out that we had had a brief email exchange earlier this year.) Turns out that we two strangers—suddenly connected at some guerilla PD—had seemingly millions of things in common that we could jam on: unschooling and computer programming, navigating Twitter and building culture in schools. From our first problem-wrangling session, to dinner and lunch, to rapid-fire reflections on the car trip (thanks, Wendy!) back to Brooklyn, there was, again, so much. And I know there’s much more in the future. Thanks, Jasmine. And finally, Dan Anderson (@dandersod). We’ve been blogging and tweeting together for years, and more recently we’ve worked together on Daily Desmos. I shook hands with Dan and said “hi” one of the first days. And that was it. “Life just got in the way.” Did I miss out? On Dan, yup. But this is the way of the world. If you’re attuned to great things, of course you won’t be able to experience everything. (Twitter lesson #4) But that is the joy of abundance. Next time, Dan. In the meanwhile, we’ve got the interwebs. Thanks for all of the awesome you do there. There’s me and Dan Anderson at the same dinner table. So close, and yet so far! PS Dan reminds me that we also got to do “radian arms” on the way to dinner. I’ll try to rustle up the photo! The internet is good at connecting people, but it’s the connecting to people that matters, not the medium. This article came out in the Times a bit ago about how your teens and early twenties are when you make your best friends for life, and that in your thirties and beyond friendships arise in more niche-y fashion, or come out of convenience. 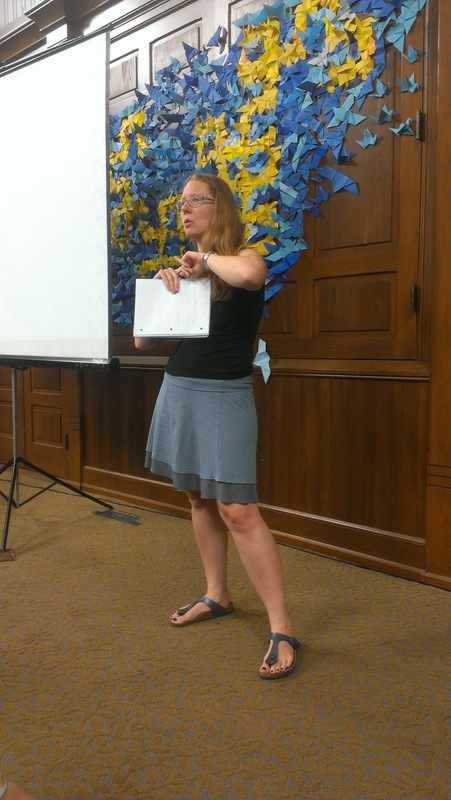 For me, #TMC13 was a loud, vibrant tsunami of a rebuttal to that article. Twitter Math Camp isn’t special because of what happens there. It’s special because of what happens before and after, because of what happens here—on the internet, on blogs, on Twitter. Friendships aren’t made at TMC—they are revealed. So if you attended Twitter Jealousy Camp this year, don’t be too jealous, because you get to ride this incredible wave for the next twelve months and beyond. To Kate and Elizabeth, for coordinating a wonderful PCMI morning session, and to my awesome co-participants. To Lisa and the organizing committee. Amazing. We’re designing it to help those who are just starting out with the mathtwitterblogosphere, as well as for those who have dipped their toes in and want to get even more involved. Or even if you have dropped off the face of the virtual planet and want to join back in! Each week we will post a new adventure for you to participate in involving the online math teacher community. And we are planning a “virtual reward” for those who participate in every event! However you don’t have to participate every week — you have to do what’s good for you. By the end, we hope you have a feel for a bunch of what all’s out there. Ultimately, the end goal is personal growth—not comments and blog readership. Join us on this exciting adventure! Meet new friends! Get tons of new ideas! So that everyone can start school smoothly, we’re going to be starting this in October, and we’ll release more information in mid-September. With summer in sight, I’d like to share two opportunities where you could “develop professionally” in the weeks and months ahead. I have a hand in both. 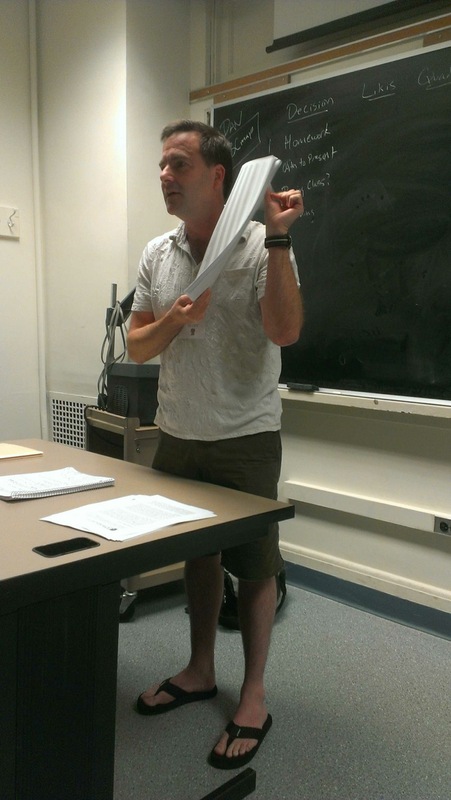 The first is the New York Math Circle’s Summer Teacher Workshop at Bard College. It’s for middle school teachers and runs from July 29 to August 2. This year’s theme is Surface Area and Volume. I got to attend NYMC’s workshop the summer before last, when the theme was Inequalities, and it was awesome. I’m co-directing this summer’s workshop with Japheth Wood, who’s both a mathematician and the Executive Director of the New York Math circle. (Japheth tweets at @japhethwood.) Co-directing means that we’ll be at Bard for the workshop (duh), that we’re coordinate bringing in presenters, and that we’re creating the daily morning problem sets. And facilitating those sessions. Tubular! I’ll also likely give an afternoon talk about the connections between the surface area and volume concepts we teach in middle school and some once-known and perhaps still-remembered nuggets from calculus. If you’re a middle school teacher in the New York area and are free that week, you should totally come. You can read further tantalizing details and register on the NYMC website. I’d like to facilitate a small, open, online course that will help participants to examine and build up their own relationships with mathematics; to reflect on how this does and can affect the way they share math with their students; and to reflect on how sharing Math Munch with their students could be incorporated into their classroom practices. The course will be convenient, personalized, and free. Most of your experience will be at your own pace and on your own schedule, punctuated by some Google Hangouts. It’ll run for fours weeks, from June 23 to July 20. You can find additional details on this smOOC page. By small, I mean up to ten participants. (If the course goes well, I’m sure I’ll want to run another session of it in the future.) I’m not opening registration right away, because I don’t want the twitterholics and refresh-addicts to gobble up all the spots before anyone else even finds out about it. You can register starting on Wednesday (June 12), so mark those calendars! The course is open to anyone who shares math with others—first come, first served. If spending some time reflecting about yourself and math sounds exciting to you, then I would lovelovelove to have you aboard. Please spread the word about these two opportunities to anyone you think may be interested! The other weekend I was returning to New York from my brother’s graduation in Austin. On the plane I sat next to a little girl who—as I came to find out—was travelling by herself. We ended up chatting later on in the flight, and she told me how she was in fourth grade and would be moving to Texas soon. She told me about the book she was reading and I told her about the book I was reading and we discussed the snack packs available for purchase and lots of other things. But as we sat on the runway, before all of that, here’s what I saw: a little girl, buckled in, but lifting herself up a little out of her seat. So that she could see the safety demonstration. Hanging on every word. Hands-on? Interdisciplinary? Flipped? Problem-based? Project-based? Real-world? Student-centered? Those are all adjectives, and maybe useful ones. But what I saw? That’s learning. That’s right. I’ve circumblogivated the year! Eat your heart out, Magellan. It’s actually been a year and two months, but that’s all to the good. Thank you so much for reading, commenting on, and sharing what I write here on I Choose Math. It’s been amazingly fruitful, satisfying, and fun to participate in the online math ed community through blogging. The new school year has been busy, of course, and has prompted me to some new projects. Let me tell you about some! First, what better way to celebrate a year of blogging that to start more blogs? Inspired by Frank’s 180blog from last year and jonesing to jump on the zeitgeist, I’m photoblogging my way through the year at lanier180.wordpress.com. I feel like what I write about here on I Choose Math tends toward the theoretical and “big picture”, and that I usually only post when I “have something to say.” And I’m totally happy and excited that I have a place to share those thoughts. Still, I’m hoping (and it’s been true so far) that by blogging daily about my classroom practice, I’ll look at my classroom a little differently and have the chance to reflect on what goes on there in further useful ways. Plus, it’s been a lot of fun so far to write about my day-to-day teaching experience! Another blogging project is for my Geometry: Investigations class: investigations1213.blogspot.com. This is the third year I’ve taught this course—it’s a version of Geometry that students can opt into—but this is the first year when it’s been officially “mine.” As in, my name was next to it in the course catalog. The class is built around large, rich geometrical Investigations that students take on individually, in small groups, and as a whole class. On our class blog, students have been making posts about their work and commenting on each other’s posts. The site’s beginning to hit its stride. I also post a lot of our class’s materials on the site—you can get a pretty good picture of how our classroom runs by clicking around on it. And feel free to comment on students’ posts! One of my seventh grade classes is really ramped up to have their own website—their idea, not mine—and we’ve just gotten the administrative go ahead for it. We brainstormed names for it last class. And we’ve got a nascent school-wide math art blog going as well. And rest assured there are non-blogging projects, too. A big one is that I’m working to help my students assume more responsibility for creating and compiling evidence of their learning. I read a blog post this summer (which I can’t find now) that discussed placing the burden of proof of learning on students. My new mindset is that it’s not my job to gather evidence that my students have learned such-and-such—rather, it’s my job to help them to create and showcase this evidence. This is harder, but it’s also more authentic. Here’s a generic Geometry portfolio from my class that you can check out. So that’s what’s cooking. Superfun. More soon!